The Yankees, after all, lost a game in this series and let the Red Sox celebrate the division title in Bronx. It happens. Another noteworthy thing that happened in the past three games is that they took two out of the three from the hottest team in baseball this year. A sweep would have been nicer, though. Oh well. The Yankees also set two home run records but that feels like a footnote now. The Yankees had a 6-4 lead after the fourth, but the Sox offense struck back against the bullpen and then more. The Red Sox got it started with their very first batter of the game. Mookie Betts got a hold of Masahiro Tanaka’s fastball and hit a leadoff double that hit the top of the left field wall. Andrew Benintendi grounded out to advance Betts to third. The Yankees brought the infield in to face J.D. Martinez and it didn’t work, as he singled through the middle for an RBI single. 1-0 Red Sox. Tanaka got out of the inning without further damage, but not before the Red Sox top hitters made him throw 31 pitches. The Yankee hitters responded by making Eduardo Rodriguez throw 29 pitches, but failed to push a run across. Boston did more damage in the second. Rafael Devers and Blake Swihart led off the inning with a single each. Tanaka bounced back by grounding out Jackie Bradley Jr. and striking out Christian Vazquez. Up came Mookie Betts, who is a huge thorn in the side for pitchers regardless of the situation. In a 0-2 count, after discussing it with Gary Sanchez, Tanaka threw a fastball on the low outside corner and Betts didn’t miss any of it. He lined the pitch into the center for a two-RBI single to add to their lead. 3-0 Sox. The Bombers jumped on Rodriguez for two runs in the bottom of the inning. It came from a bat of none other than Luke Voit, who’s been literally one of the best hitters in the majors in the past 30 days. With Sanchez on first, Voit hit a Rodriguez fastball down the middle over the center field fence for a two-run homer. I don’t know if the league will figure him out or not, but man, he is so fun to watch *and* has provided a much-needed solution to the first baseman problem. It only took Giovanny Gallegos and Chasen Shreve. With the Voit homer, the Yankees have 12 players with 1o or more home runs in a season, which is a Major League record. They also have 246 big flies this season, which is a franchise record. Pretty cool, huh? This is the dingerest season in the franchise history full of dinger hitters. That’s also coming with Sanchez banged up and struggling for most of the season, Aaron Judge injured for about two months, Giancarlo Stanton going through slumps here and there, etc. Imagine how it could have been had they been healthier. The philosophy is to keep piling on baserunners and push for the runners to score. The Yankees had their share of baserunners for the first three innings – eight, to be precise – and managed to score only two. In the fourth, however, they brought in four with a Giancarlo Stanton granny. E-Rod started the inning by retiring Voit and Gleyber Torres. Then his command hit a snag. Andrew McCutchen, Judge and Aaron Hicks all worked a to load the bases and Alex Cora pulled the lefty out of the game. It wasn’t clear that Rodriguez was going deep into the outing either, as he had accumulated upwards of 80 pitches before the frame started. In came Heath Hembree, facing Giancarlo Stanton. Stanton took the first pitch fastball for a strike. Hembree responded with a slider outside but Stanton didn’t miss any of it. His swing looked like a flick of the wrist with his arm extended, but that was a good enough. He made contact, and the ball sailed over the right field fence for a grand slam. 6-4 Yankees. Looking back, that was certainly a big moment. But the Red Sox do have a formidable offense that you couldn’t help but feel it nagging in the back of the head that the game is far from over. Had the Yankees held the lead for the rest of it, it would have been something iconic for rest of the year, and something we’d look back for next few years (a la Mark Teixeira grand slam in late 2016 vs. Boston). In the following frame, Tanaka continued to struggle. Betts doubled to lead it off and Benintendi singled to put runners on corners with J.D. Martinez due up. With 83 pitches thrown in four innings, Boone decided not to take any more risks with Tanaka and went to the bullpen. 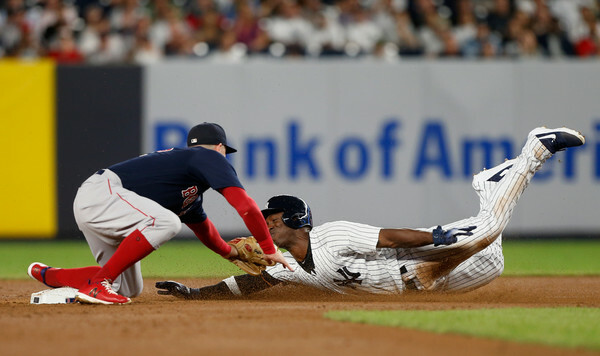 David Robertson induced a run-scoring double play to erased the baserunners and kept the Yankees’ one-run lead heading into the bottom of fifth. What happened after that… wasn’t pretty. After both Tanaka and Rodriguez got knocked out of the game, it was up to the both teams’ bullpen to hold each other’s offense. Unfortunately for the Yanks, it was the Red Sox that did it better. Things got off to a decent start. After Robertson got out of the fifth with only one inherited runner scored, Chad Green took over in the sixth and struck out the side. However, in the seventh, he allowed a second-deck home run to Jackie Bradley Jr. for a tie game and a single to Christian Vazquez. Boone went to the bullpen and brought in Dellin Betances. He struck out Betts but Benintendi followed it up with a double to put two runners in scoring position. The Yankees opted to intentionally walk J.D. Martinez, which, even in hindsight, is what I would have done. Basically, better not to pitch to the literal scariest power hitter in the league in a crucial situation and hope for the best. Up came Xander Bogaerts. Betances got the Sox shortstop to the 1-2 count and threw him a curveball. Bogaerts hit it deep into the center enough to score a run. Hicks, instead of trying for home, unleashed a laser to third to keep Benintendi at third. The ball bounced in front of Miguel Andujar, went past his glove and into the seats. That blunder allowed Benintendi to advance to home for a 8-6 Sox lead. Usually, the pitcher should be backing up the infielder receiving the throw from outfield, but Betances was caught in between home and third. To be fair, I don’t think Betances (as tall as he is) can defend this hop. For the record, no, I don’t think there was anything wrong with what Boone did. It was simply the matter of putting your best relievers out there and them getting it done. Robertson/Green/Betances are capable of shutting down many lineups but they simply failed. Nothing much you can do as a manager when that’s the case. On the other side, the Red Sox brought in the knuckleballer Steven Wright. As the famed hitting coach Charley Lau once said, there’s not a lot of ways to hit that pitch. Wright took the field from the fifth to seventh and yielded only one baserunner (Didi single in the seventh). The Red Sox iced it – both the game and their champagne – with Aroldis Chapman on the mound. Chapman, understandably rusty after his first appearance since August 21 (so, about a month), allowed Devers and Bradley Jr. to reach with a single and walk respectively. However, he did strike out Sandy Leon and lined out Steve Pearce to become an out away from getting out of it with a two-run deficit. Mookie Betts said not so fast. He took a 84 mph slider inside – one of the worst from Chapman – and deposited it into the left field seats for a 11-6 Red Sox lead. The score stayed that way for good. Ryan Brasier and Craig Kimbrel shut down the Yankee offense for the rest of it to win the game and clinch the AL East. Here’s tonight’s game’s box score, video highlights, updated standings and the WPA. Time to secure the top Wild Card spot. The Yankees will welcome the Orioles for the weekend for the final regular season series at the Boogie Down. Longtime Yankee CC Sabathia will take the mound against the former Yankee farmhand Yefry Ramirez.